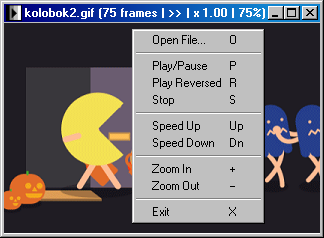 AniGIF is a GIF viewer that can open files containing a single image as well as play animated GIFs. The program provides features to control playback of animated GIFs by changing mode, speed and direction of replay. For this purpose, you can alternatively use commands from the floating menu or hotkeys. You can open a file either (1) with the dialog «Open File», or by dragging the file to (2) the program’s window or (3) to its icon in the Windows Explorer. If a directory contains many GIF files, the navigation with arrow keys is possible. Apart from that, when you set the program as a default for opening GIF files, it will be automatically launched by clicking a file with the .gif extension. The window title bar displays the following parameters of the file as well as of the playback: (1) file name, (2) number of frames, in the pause mode also the number of the current frame, (3) playback direction: »» (normal) or «« (reversed), (4) playback speed, (5) magnification factor. The GIF decoder can read compressed data that start with a code different from the Clear code. The program consists of one .exe file and runs out of the box.